Caroline Hamilton, founder of the London Dolls House Festival and author of the inspiring "Decorative Dolls Houses", approached me in late 1999 with the idea for a new kitchen. As she pointed out, she didn't have room for another house, so it would have to be a room box, and inspiration had come with a supermarket salad bowl! 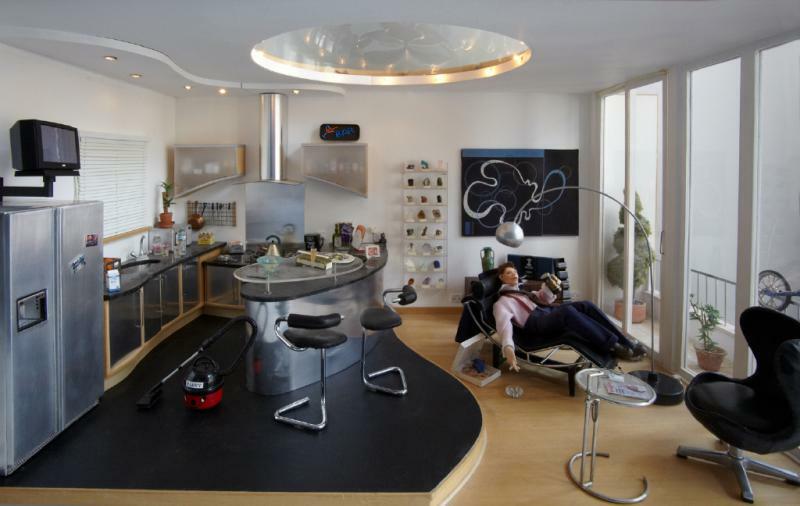 With everyone talking of the new Millennium, and wild speculation about the new "Dome" shortly to be unveiled in London's Docklands, Caroline's salad bowl would be her Milllennium Dome....in a luxury loft apartment. We ultimately substituted the salad bowl with a gleaming architectural dome, but the seed had been sown. After much consultation and scribbled drawings, the plan emerged for "Nick Loadsamoney and his London loft apartment". The curve of the dome was echoed by the curves in the kitchen, and even the split level floor. He looks out of his sweeping windows to his private balcony and the City skyline beyond. A keen observer might ask, given his carefree attitude and the cigarette dangling over the ashtray, what exactly our young man is growing on that private balcony! 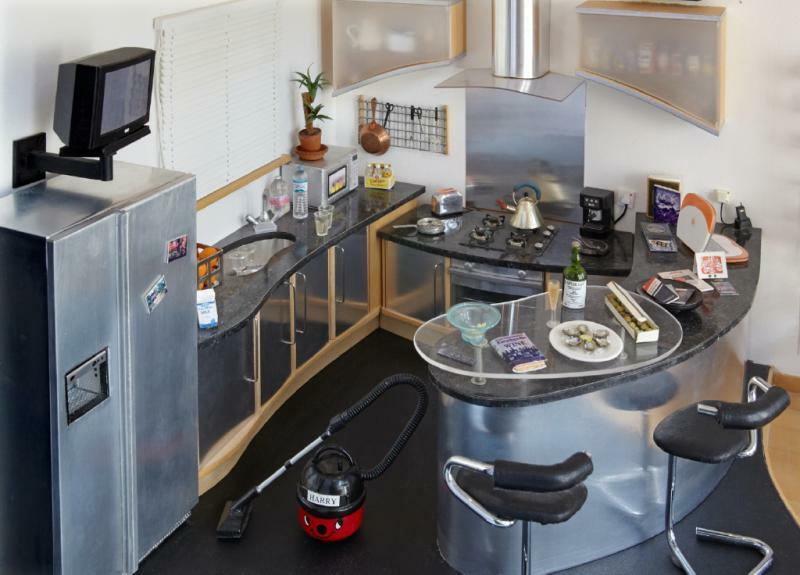 We gave Nick the latest in kitchen design, but the discarded pizza box tells its own story! The Millennium project features in Caroline's new book "Our Dollshouses" by Caroline Hamilton and June Fiddick, available to order from www.newbyhall.com. The houses are now on permanent display at Newby Hall, so make a note in your diary and plan a visit - or simply be inspired by the book!